It isn’t very often that you get to write about your own death. Ok, spoiler alert, I didn’t really die, in or out of the airplane, but I did get to experience what it would have been like if I had. Here’s what happened. As I recall, the instructions included, among other things, flying to a lake and circle it to look for and merge with other aircraft, then fly 1/2 mile distance apart at a certain altitude and airspeed along a railroad track until you get to a water tower in a small town, then listen-only for instructions on the radio for when to turn and an assignment of one of three colored dots on which to land on the runway, acknowledging by rocking your wings. Then you are to have a sign in your window so the ground crew knows where you wish to taxi and park, so they will point to direct you to taxi and then hand you off to the next person, with that taxi-direction pointing and handoffs to continue until you’ve reached your specific parking spot. It’s all NORAD, which means ‘no radio’ on the ground. The primary reason for that is to get people to keep their heads looking out the windows for safety. I arrived safely and parked in the prime experimental aircraft camping area. I set up camp next to my RV-4 and went to the portable rest room trailer at the end of my row of aircraft. I then set out to mingle with the more than 10,000 aircraft and half-a-million people over the course of the week. It was a great time! I met up with my date briefly, but she was involved in the CAP duties and I was busy meeting with dozens of aviation friends that also go to ‘Oshkosh’ and for many of them, this is the only time I get to see them. At some point during the trip I realized I had forgotten my cell phone charger, so I was using my phone sparingly and occasionally borrowing a charger to replenish my phone enough to get by. Knowing this, my date and I were both leaving on the last day of the event and we decided to rendezvous at a specific airport at a specific time about half-way home. On the day of departure, my cell phone died. I went to see some last-minute attractions, packed up camp and carefully loaded the airplane. I then walked to the FAA booth at the event to check weather and file a flight plan. I got fuel to ensure I had plenty to spare for taxiing and the flight home. I flagged down a ground crew and let them know I was planning to leave. I started the plane and taxi’d for a bit and then stopped. After sitting for a while, I got the signal to shut down the aircraft. There had been an accident on the taxiway. This series of unfortunate events continues to unfold. Due to the accident, I was unable to depart as scheduled. My aircraft was parked in a different location, so all of my friends at the event thought I had departed. My date had left for our rendezvous and I was without my cell phone. Before I could find my friends, they had been parked in different areas and were able to depart as scheduled or were busy doing other things and I was unable to find them or contact them. I was exhausted after a week of walking and visiting and flying and camping. I walked over to view the accident and it was awful. A large warbird taildragger with a big radial engine and 3-blade prop called a Grumman TBM Avenger had been taxiing behind a smaller RV-6, which was a side-by-side airplane similar to my tandem seat RV-4. 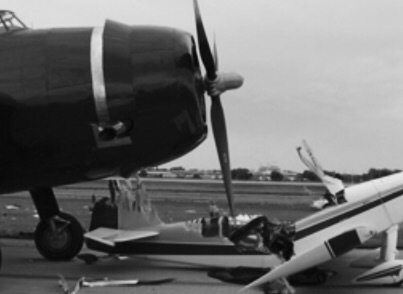 There had been a mistake and since the taildragger couldn’t see directly in front of him, and the RV-6 had stopped and the propeller of the TBM had chopped up the RV-6, killing the passenger but the pilot was ok. I’m sure the guy in the TBM felt horrible. Somehow the ground crew or one of the pilots had miss-communicated and made a mistake. It was very sad and humbling. It was getting late, so I re-set up camp in the new location with what was left of daylight, walked down and took a shower and then went to bed, planning an early morning departure. I didn’t meet with my date, nor could I call. Perhaps worse was that, unbeknownst to me, the media had reported that a Warbird had killed an occupant of the experimental RV aircraft. All of my friends and family tried to call, as well as my date, and no-one could reach me. The news wouldn’t release the names until the family had been notified. My EAA savvy friends and family contacted the EAA to find out about me, but they weren’t able to find me because I was not in my registered location. To everyone concerned, it appeared as though I had been killed in my aircraft. Fortunately for me, I didn’t know everyone thought I had been killed in the airplane and I slept well. I got up early and was able to be one of the first departures that morning. The flight home was uneventful and I arrived safely. Then I unloaded the airplane into my truck and took some time to clean the weeks worth of camping and Airshow out of the airplane. Then I went home and took a nice warm shower, checked my mail and plugged in my phone to charge it. I was rehearsing what I would tell my date for inadvertently standing her up. After a while my phone sprang to life. It had over 100 text messages and the voicemail was full with dozens of new messages! What in the world? I mean, I figured the date would be upset, so I expected that, but why had all the other people called and texted? As I started to check the messages the horror of what others had experienced in the wake of my perceived death started to come to light. The media’s report that someone had been killed in the experimental RV aircraft by a large warbird caught everyone’s attention. It was National News! The fact that they didn’t list the specific model of RV aircraft (there were like 8 different models) or the colors (mine was red and white, the one in the accident was not) and didn’t release the names cause much concern. So naturally, people wanted to call or text to ensure I was ok. When I didn’t respond to anyone’s calls, they started talking to each other. When the EAA itself couldn’t confirm my safety or location, it fueled panic! The least concerned was the date who had known I had forgotten my cell charger and thought part of the error might have been hers so she got a hotel and also got some much-needed sleep. Since we were recently acquainted, she wasn’t connected to any of my friends or family.